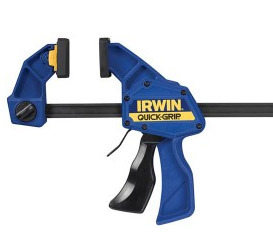 In this part of our tool reviews series we asked our demonstration team to test out the Irwin Quick Grip Clamp to find out how valuable a quick release clamp of this type would be in a home improver's tool kit. We wanted to see how easy this clamp is to operate in a real world situation and also look at it's build quality. We had the assistance of Irwin’s own demonstrator for this series tool reviews which was a great benefit as he provided an indepth insight into each tool including the Quick Grip Clamp. We tested the clamps in a real-life situation by clamping a timber to a workbench and using the clamp to make sure the timber stayed stock-still while we sawed into it with (coincidentally, an Irwin Jack saw). This clamp would be ideal for carrying out any cutting and sawing of timber as shown on this project. The clamps jaws are adjustable for clamping surface which are not square to each other and the jaws reverse to allow the clamp to be used as a spreader as well as a clamp. A really useful feature for (for example) sliding tight fitting shelves into a shelf unit. The clamp was easily applied with a couple of squeezes and unlike many other clamps there was no over squeezing to ensure the ratchet clicked into place. The timber was solidly help against the worktop and sawing was safe and effortless as a result. Releasing the clamp was beautifully easy with a soft press on the release trigger it was free. It didn’t stick and was off in less than a second. A great tool for the carpentry or metalwork workshop. This really is a well built, strong clamp which will out perform many clamps on the market. If you would like to find out more or even purchase the Irwin Quick Grip Clamp check out our DIY superstore. With it’s range of well thought out and designed features and the fact that it can be used to clamp and spread items this is a great addition to anyone’s tool kit and a must-have asset for any job! The fact that it can also apply up to 135kg of clamping pressure and ensure that no surfaces are damaged due to it’s soft pad jaws it well deserves solid 4 out of 5 stars.